NEIU’s El Centro Campus has helped transform the Avondale neighborhood in which it resides. Prior to construction, the site was a semi-abandoned warehouse location that was a frequent target for gang activity and illegal dumping. Northeastern worked for more than a year with the City of Chicago and Union Pacific to clean up the area surrounding the track bed, improving safety in the area by repairing broken fences and cutting down scrub bushes. Additionally, working closely with the EPA, the site was entered into a Site Remediation Program to remove soil contamination due to years of neglect. All of these efforts combined have created a safer and pedestrian-friendly area in the Avondale area of Chicago. El Centro continues to serve as an environmentally-friendly model for the neighborhood and has become a catalyst for change / redevelopment in the surrounding areas. Having a construction waste management plan for NEIU El Centro allowed the team to divert 91 percent of construction materials from being landfilled. The clean, heavy debris, for example, was reused for roads and land reclamation, the non-hazardous lumber was used for mulch, compost and feedstock and all types of metal remnants were recycled through local scrap metal processors. Interior materials include recycled milled steel, fly-ash concrete, bamboo, cork, porcelain tile, and recycled carpet tiles. In addition, many of the building materials were designed locally, including the glazed curtain wall and laminated acoustical glass. 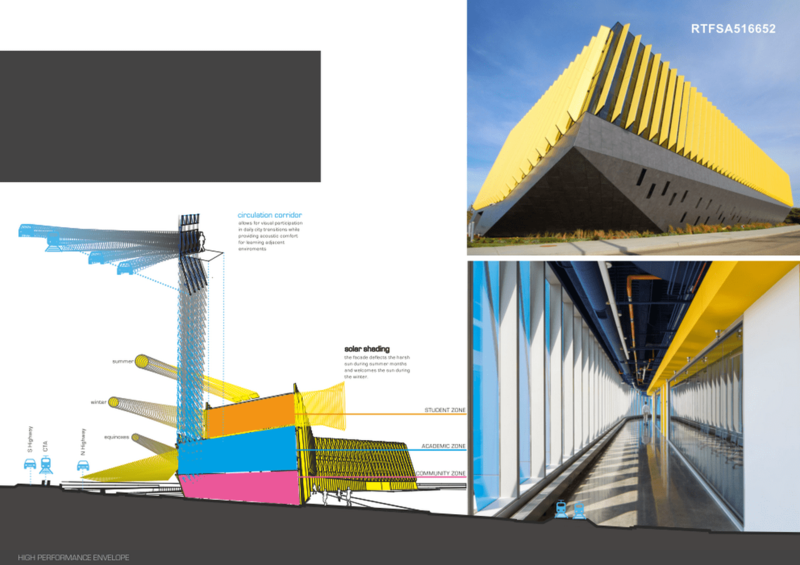 The integrated design process allowed the team to select synergistic systems that optimize energy performance and improve the thermal envelope. The building’s sculptural form and strategically located fins create an efficient sun-shading and acoustical-buffering barrier, protecting students from the intensity of the setting western sun and the roar of rush hour traffic. Daylight harvesting as well as the LED lighting and occupancy sensors have tremendously reduced the interior lighting power density. Atop the building sits an 80-kilowatt photovoltaic array that covers the cantilevered roof and reduces El Centro’s reliance on alternate sources of nonrenewable energy by offsetting 9% of the buildings energy use. Lastly, a low U-value thermally broken curtain wall system was utilized lower the mechanical load while still providing natural light to virtually every space within the building. Consequently, El Centro has achieved an energy cost savings of about 30 percent from a similar building of its size and use. 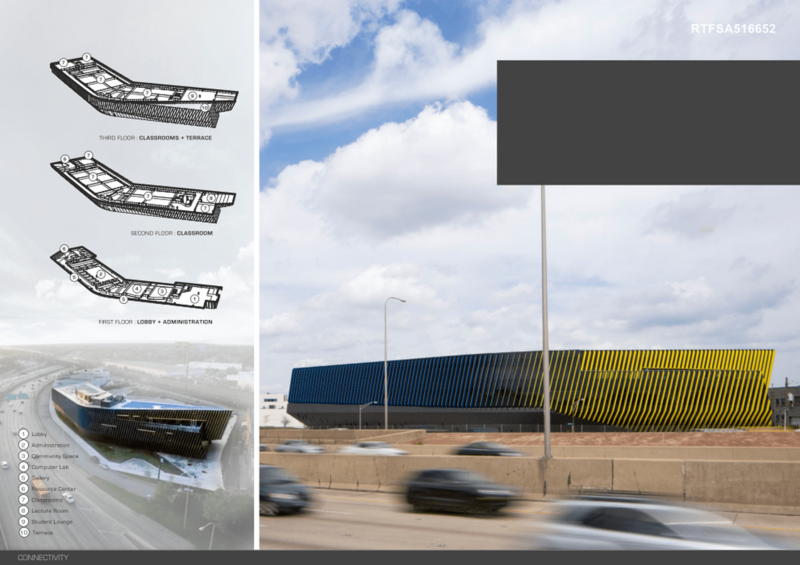 The building’s design is inspired by the unique site geometry and creates a dialogue with expressway passengers who are the captive audience during their inbound and outbound commutes. 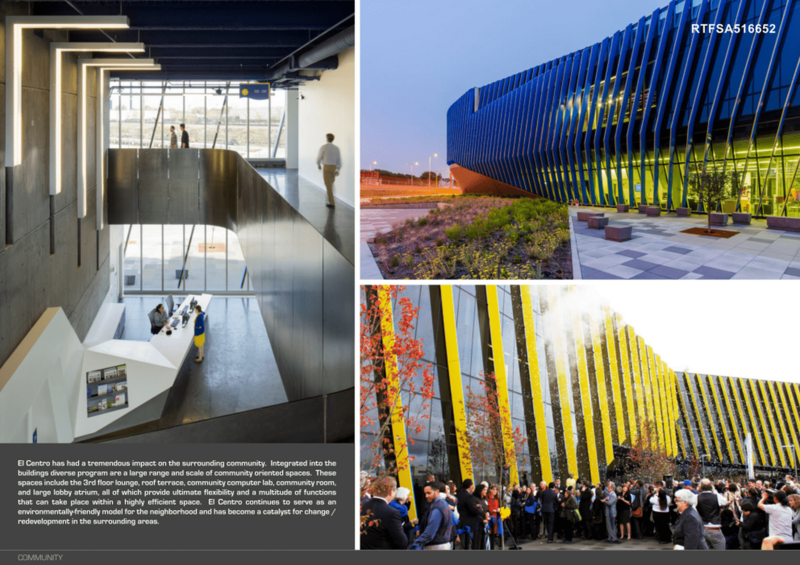 The architecture asserts its presence, through twisting roof forms and the bold school colors prominent on the vertical louvers rhythmically arrayed along the building’s exterior. 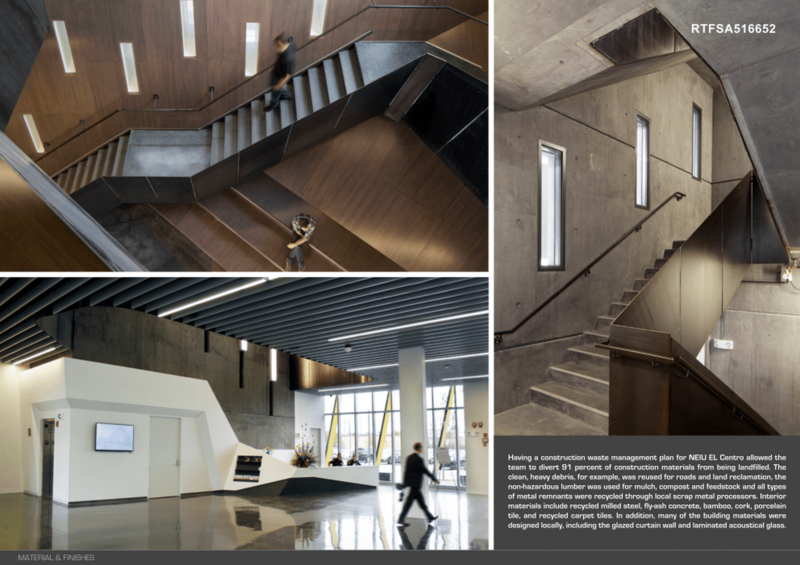 Integrated into the buildings diverse program are a large range and scale of community oriented spaces, all of which provide ultimate flexibility and a multitude of functions. Sustainability represents a heightened environmental awareness in the building design. However, it is the project’s ability to inspire minor youth to attend a higher education institution that creates an undeniable cultural of sustainability.